Obverse: Sky-blue enamelled, gold-rimmed 75mm wide cross. The central medallion depicts an elaborate mosaic-style portrait of the two Saints, while on the outer ring is inscribed the motto of the order in Latin – “Ex Oriente Lux” (Light comes from the East) and a small star in between two decorative elements at the bottom. In between the cross arms there are red-enamelled flames with superimposed gilded fleur-de-lis. Reverse: Sky-blue enamelled, gold-rimmed 75mm wide cross. The central medallion depicts the founder’s crowned royal cypher in gild upon a dark red (in most cases) background, while on the outer ring is inscribed the date when the order was founded - “XVIII MAJUS” and the year “MDCCCCIX” all in Latin. The two sections are separated via two sets of decorative elements. In between the cross arms there are red-enamelled flames. 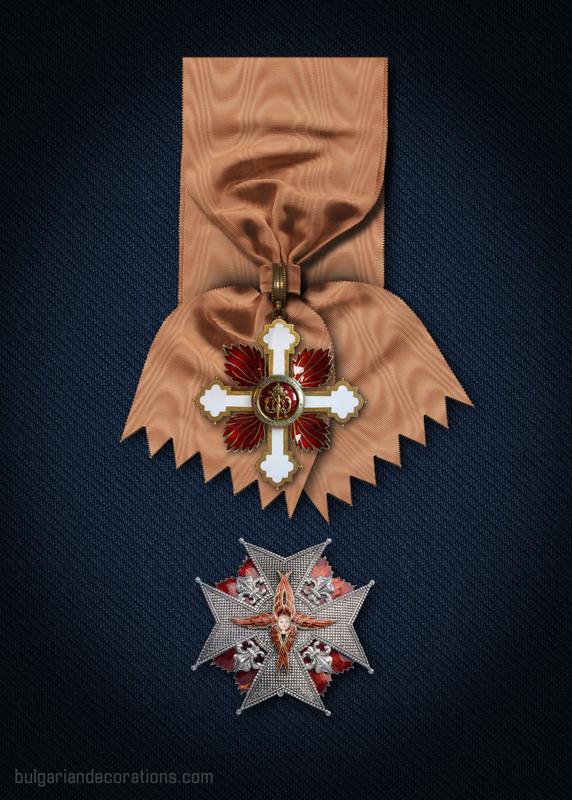 The highest Bulgarian award – the Order of SS Cyril and Methodius has been founded soon after the official declaration of the Independence in 1908. The intention for its creation though has been around for some years prior to it. This is the only Bulgarian order to have been legislated and passed by the national Parliament in the form of a law. According to its statute, the order can only be awarded to 1) the most senior statesmen (generals, senior clergymen etc.) who have already been decorated with the highest classes of the other Bulgarian orders for their merits and faithfulness; 2) Foreign nationals – Christian sovereigns and members of their family, heads of state and alike with great merits to the Kingdom of Bulgaria or mankind in general. Similarly to the Order of the Holy Ghost, which has been used as a model when designing the Bulgarian award, the Order of SS Cyril and Methodius structure and regulations resemble the ones of a medieval order. The stature of the order limits the number of living Bulgarian knights to 15. This number has never actually been reached, due to the catastrophic consequences of the Second World war and the Communist coup-d'etat. 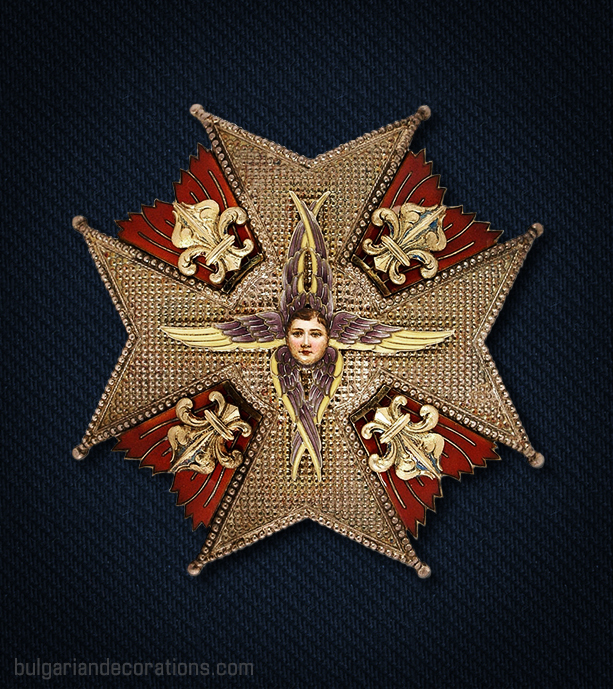 Contrary to the popular belief, the order actually has only one class – Knight Grand Cross. Knights of the order are presented with the badge, suspended from a wide peachy in colour order sash (symbolising the colour of a dawn) which is being worn over the left shoulder and across the chest. 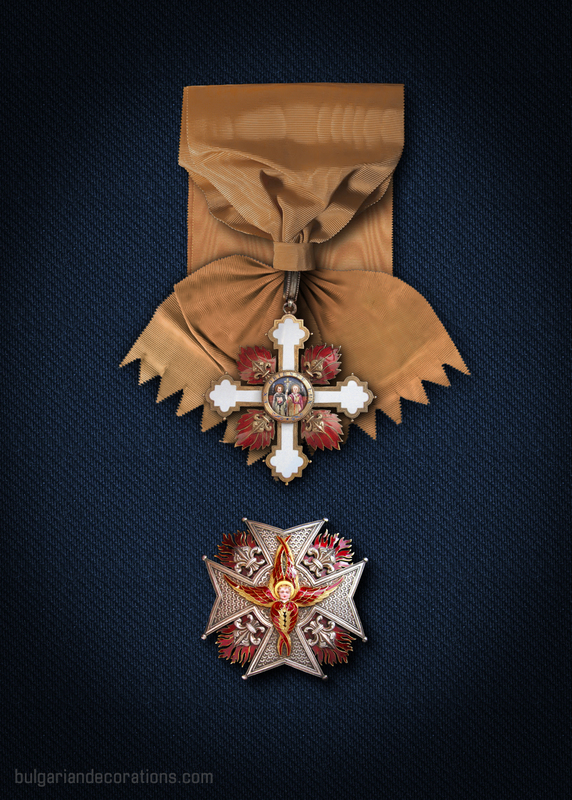 In addition to the badge and sash, knights also display on their left breast an order star – an elaborately designed silver Maltese cross with circular centre. Upon the middle of the star, there’s a seraph enamelled in red and in between the cross arms there are decorative flames enamelled in red. Upon each of them is placed a silver fleur-de-lis. 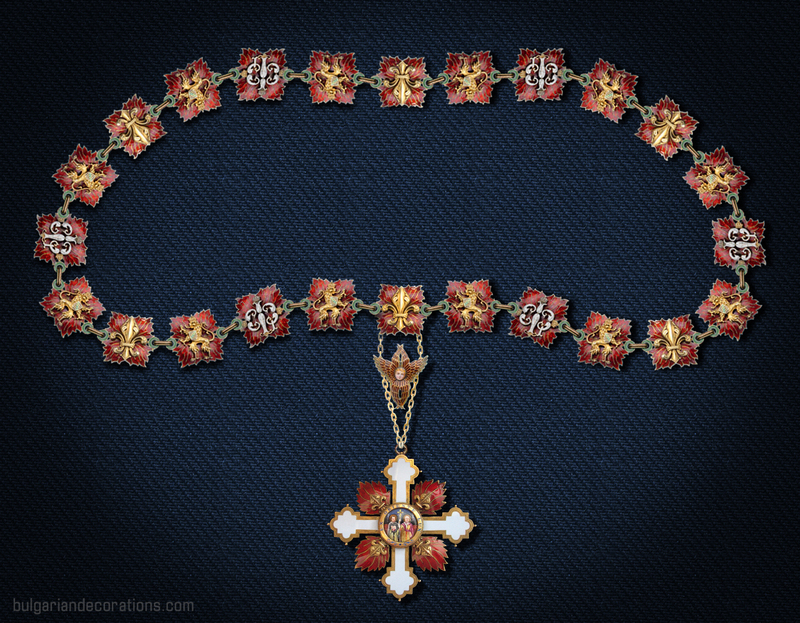 In addition to the Grand Cross set, certain knights may also be presented with an order necklace (also called chain or collar), in order to indicate their status and/or outstanding merits. There are two types of collars – Grand Collar and Lesser Collar. The Grand necklace is practically the highest grade of the order. It has been awarded to a handful of people, mainly foreign Sovereigns and heads of state. It is made up of 25 sections depicting decorative flames which are enamelled in dark red and charged with either a gilded lion rampant with Saxon shield upon its chest (12 in total), gilded fleur-de-lis (7) or white enamelled founder’s cypher (6). The sections have green enamelled loops on either side which are interconnected with one another using gilded loops. From the central flame section is suspended (via two sets of chains) the order badge (identical to the one of the Grand Cross). 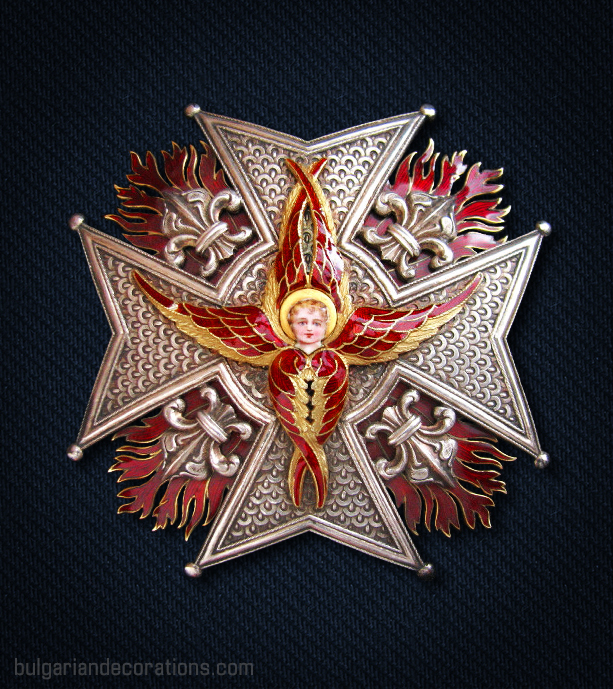 As a middle section between the badge and the chain is used a red-enamelled and gilded Biblical seraph, similar to the one featured on the breast star. There’s some debate as to whether there’s also a unique, Grand Master’s collar grade of the order – privilege of the Grand master of the order (i.e. the ruling Monarch). This has been fuelled by the fact that there’s a special chain made up of larger in size and fewer in number sections, which has been worn by King Ferdinand I. Essentially, this amended version of the Grand collar can simply be interpreted as a more elaborate design of the latter, rather than a dedicated sub-class. This is indirectly confirmed by the fact that according to the Regulations issued by the Chancellery of Bulgarian orders in the 20's, there’s no mention of any differentiation between Grand and Lesser collars. The only text in this regard states that the order can also be awarded and worn suspended from a chain. This provides a more broad interpretation of the word ‘chain’ which is proven by the fact that both Tsar Ferdinand I and Tsar Simeon II have been photographed displaying the order badge suspended from a thin gold chain, as opposed to either of the two generic collars. The Lesser collar represents a smaller in size chain, made up of 26 oval elements, enamelled in red, and depicting in alternating order either a lion rampant or a Bourbon fleur-de-lis. 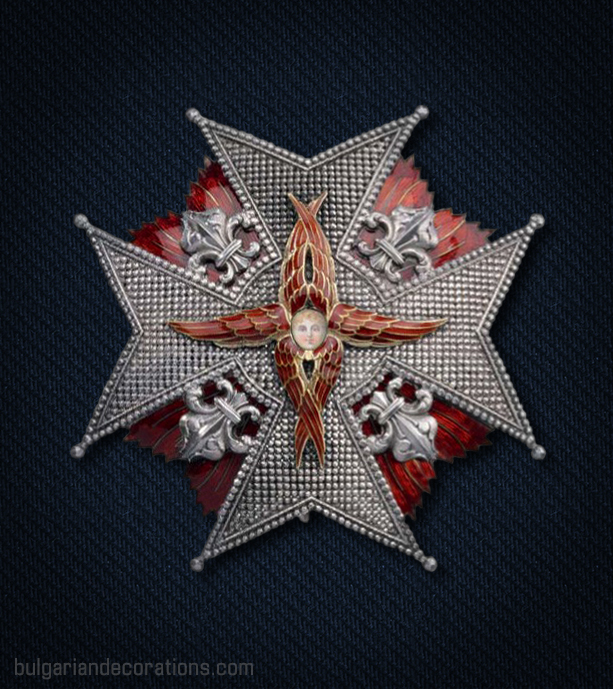 The order badge is directly suspended from one of the oval sections. It’s worn suspended at the neck. We can hardly refer to the different samples of order badges as ‘emissions’. 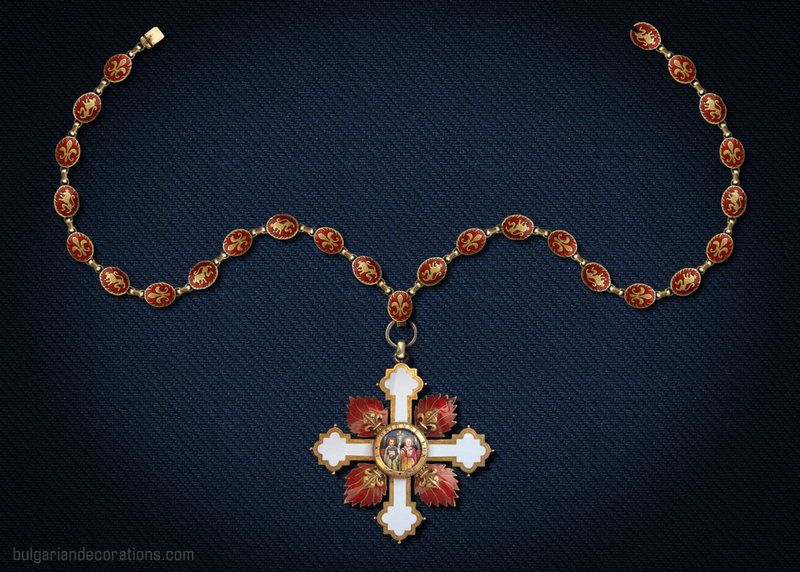 Unlike the rest of the orders, the Order of SS Cyril and Methodius has been produced in very limited numbers and certainly in most cases this has been done only upon the Monarch’s special request. Most sources indicate the total number of Bulgarian knights as nine. This number is inaccurate, due to the fact that the order has not ceased to exist. The total knights of the order are at least eleven, if not more. A list has been provided below. During the reign of the founder of the order – King Ferdinand I, five Bulgarian nationals (apart from himself) have been presented with the Grand cross set, including His two sons. Later, during the years of King Boris III, further three men have been distinguished with the highest Bulgarian order. The year in which His Majesty King Simeon has been appointed knight of the Order of SS Cyril and Methodius is unknown. However, after the death of His father and following his coming of age, the Bulgarian king has taken over the position of Grand Master of the Bulgarian orders. He presents the order to His son and heir Kardam, Prince of Tarnovo (nominally, not a Bulgarian citizen but part of the Bulgarian royal family). There are no other known decorations of people of Bulgarian descent up until today. Presumably, after the tragic death of Prince Kardam, His son and heir, Boris will take over the honorary title of Prince of Tarnovo and will be appointed knight of the Order of SS Cyril and Methodius. The orders have been produced by Rothe & Neffe in Vienna, Z.F. Zimmermann in Pforzheim and by Cejavlo in Madrid during King Simeon’s years in exile. 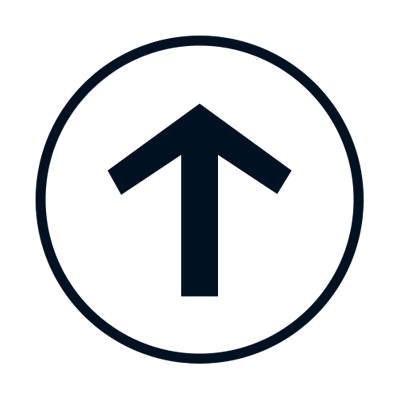 The latter samples have a slightly amended design – the background of the central medallion is dark blue and the reverse of the flames is flat.